This promotion is a partnership with COMET TV and all materials supplied have been provided by COMET. 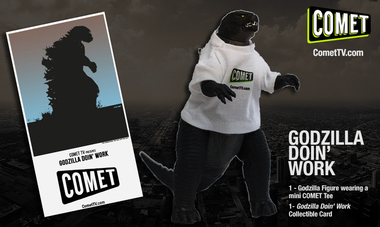 We’ve partnered with COMET TV to offer a giveaway: the Godzilla Doin’ Work Prize Pack! One winner will receive one prize package including the items listed below (winner drawn randomly). Enter by midnight , October 4 2017 using the Rafflecopter form below (U.S. only, must 18 or over, no P.O. boxes). (1) Limited Edition Godzilla COMET TV Card – Perfect for catching up with Godzilla’s comings and goings on COMET TV! Saturdays in Sept there are double features starting at 2P/1C and Godzilla will be showing up all over the COMET TV schedule, check out the times below! Each household is only eligible to win COMET TV Godzilla Doin’ Work Prize Pack via blog reviews and giveaways. Only one entrant per mailing address per giveaway. If you have won the same prize on another blog, you will not be eligible to win it again. Winner is subject to eligibility verification. My favorite Godzilla movie is the 2014 Godzilla, its super cool and i love the battle against the MUTOs. The original 1950s Godzilla movie! I think my favorite classic Godzilla movie is Son of Godzilla or Godzilla: Final Wars. I very much enjoyed the 2014 and 2016 efforts as well… in fact, the only one that ought to be disavowed is the 1998 monstrosity. A favorite is the original Godzilla movie, Gojira (1954)! The original from the 50’s is by far my favorite. Nothing can top the original! I always loved Godzilla vs Mothra….when I was little! At the moment, my favorite is the new film, Shin Godzilla. I thought it was a very clever reimagining of the Godzilla mythos and I hope there will be a sequel. Thank you for the great giveaway. My favorite is the original. It was kind of corny but I love it. Godzilla 2000 🙂 I liked it ! Even my three year old does ! The original Godzilla is my favorite. My very favorite Godzilla movie is Son of Godzilla. I love that original Godzilla in Black and White the most of all versions. My favorite Godzilla movie is the goofy one where he had a son who talked.